Apple has fallen short when it comes to storage space on its devices and once you use the space available, since there is no option to add an SD card, you are stuck. However, now there is any easy and simple way to add space to the handset and tablet without having to delete photos or uninstall your favourite apps. The trick forces the phone to 'spring clean' itself and was discovered by a Reddit user. According to eavesdroppingyou who wrote on Reddit, "I have an iPhone with 16GB so I'm always dealing with low storage." "A trick I do to get back some storage is to try to 'rent' a movie with a big file size." As an example he used Lord of the Rings: The Two Towers. "Click that and magically you will get some storage back (probably it erases some useless data from different apps to try to download the movie)." "Repeat the process 4-5 times and before you know it you recovered 1 to almost 2 Gb. try it!." How do you get the free storage space? Step 1: To check the available storage space users should go to Settings, General and Storage & iCloud Usage. Step 2: The user has to Rent a movie from iTunes which must be larger than the storage space left on the phone or tablet. 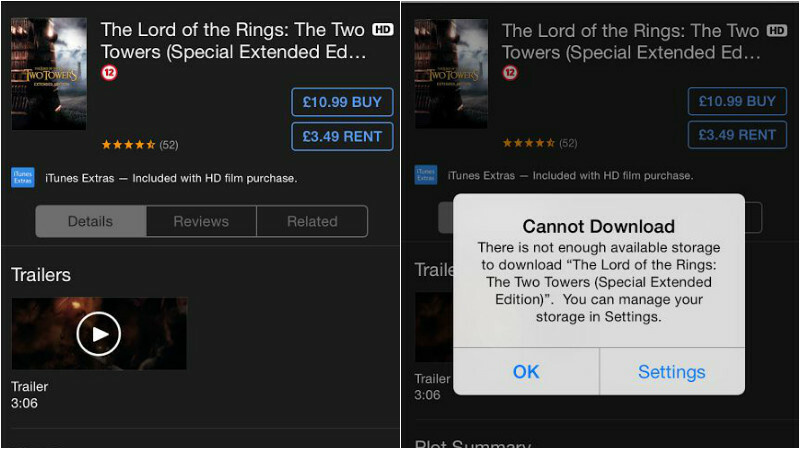 This would only work if there is less free storage space in the device than the movie you are planning to rent from the iTunes stores. Step 3: When the user attempts to Rent a movie and clicks on the button next to the film, a message shows up saying there is not enough storage to rent the movie. Step 4: A choice between 'OK or Settings' is given to the user and when the user chooses 'Settings' option, the user is taken to 'Settings' menu and the amount of storage available on the device would have already increased. The reason to get increase space is because it is trying to make room for the movie and meanwhile iPhone also cleans installed apps to remove data, cookies and histories which no longer be needed. One Reddit user was surprised with the amount of storage space and commented "That's actually clever. I just went from 800 MB to 4.9 GB free space." The article also suggested that renting the same movie many times could free up even more space. There is another trick to increase storage, when 'cannot download' prompt is shown on your phone, do not touch it for a while. A clean up process seems to run in the background until you hit 'OK or Settings' button.